Toast the arrival of 2018 at the Harbor View Hotel's 7th Annual New Year's Eve Celebration! 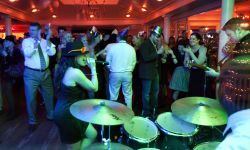 Live music, two bands and two dance floors featuring Joanne Cassidy and the Vine Shakers and Mike Benjamin Band. Enjoy a lavish array of hors d'oeuvres, available throughout the evening. At midnight step outside for the Harbor View Hotel's Fireworks Display over Edgartown Harbor and raise a glass to 2018! 21+ event. Cocktail attire required.